Same delightful fragrance. Same powerful formula. New design & 100% recycled plastic bottle. Our washing-up liquid unleashes the power of biodegradable plant-based ingredients, to leave your dishes squeaky clean. That’s Smart Green Science. • Tough on Grease. • Plant & mineral based ingredients. • Safe for sensitive skin. New bottle now made with 100% recycled plastic. Lemon & Aloe fragrance. Also available: Camomile & Clementine, Lily & Lotus, Pomegranate & Fig and our ZERO fragrance free alternative. Tough on grease. Plant & mineral based ingredients. Safe for sensitive skin. New bottle now made with 100% recycled plastic. Cruelty-Free international.Same delightful fragrance. Same powerful formula. New design & 100% recycled plastic bottle. 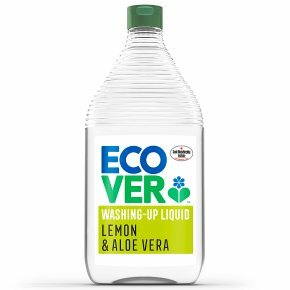 Our washing-up liquid unleashes the power of biodegradable plant-based ingredients, to leave your dishes squeaky clean. That's Smart Green Science. Usage: One squeeze is enough for a sink full of dirty dishes. WARNING<br><br>ECOVER WASHING-UP LIQUID<br>Causes serious eye irritation. Keep out of reach of children. IF IN EYES: Rinse cautiously with water for several minutes. Remove contact lenses, if present and easy to do. Continue rinsing. If eye irritation persists: Get medical advice/attention. If medical advice is needed, have product container or label at hand.